News from N22 and a Request. Monday isn't usually a busy day for us. It's usually the day I take off and Tim catches up on paperwork and reordering from the weekend's sales. 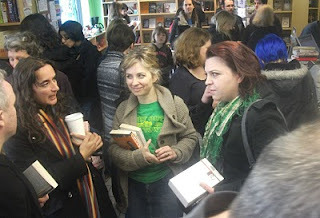 This obviously wasn't a Monday, because once again the good people of North London were out in force to show the Big Green Bookshop their support. And whilst not as manic as the weekend, there were some amazing and wonderful things that happened. I shall mention a few, although there have been so many acts of generosity over the last few days, (which I will do my very best to acknowledge), that it seems a shame to pick out particular ones. But please understand that we so so appreciate every single one of you who has helped in any way to raise awareness of our plight or contributed in any way to help rectify it. today a man bought a copy of The Ragged Trousered Philanthropist and then having paid for it, told us he'd read about our problems and asked us to put it back on the shelves so someone else could get as much joy out of it as he had when he read it. Nice choice of book too. We've had some incredible donations over the last few days. In fact any one who has decided to donate anything at all to us is pretty incredible and we cannot tell you how grateful we are. 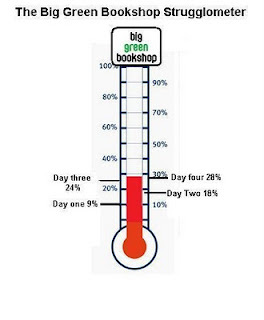 We will do our best though (as I type this, we've just had £7 donation from a bookshop in America). A stranger bought in three packets of biscuits. One for each of us. It's a shame Mark isn't here until Wednesday. We like biscuits. And today we were in The Times. page 38. Look, here we are. I have two more things to mention. 1. We are going to be doing an online book/publishing related auction, where half the proceeds will go to local schools (they're having a pretty rotten time too, so we thought we'd do something to help them). If anyone out there has anything book related that they could auction, please get in touch. It could be that you work in the book trade and know a marvellous author who'd be happy to donate a signed copy of his or her book. It could be that you're a book artist with a lovely print or something like that. It may be that you have a skill to offer any budding author. You may have a manuscript of The lord of The Rings stuck under your stairs in a box. Perhaps you are a kids author who will visit the school of the child of a winning bidder. 2. The Strugglometer, the strugglometer. There we go. Another 4% of our target has been achieved. 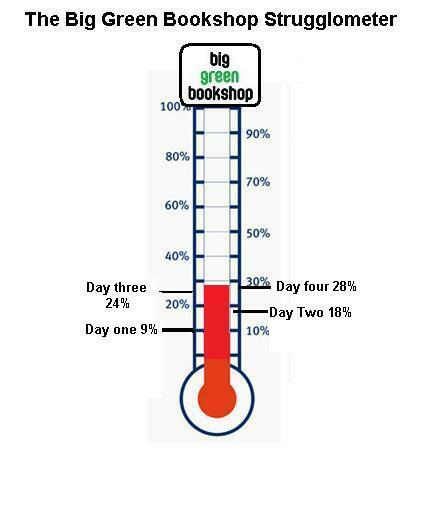 The momentum of the first few days needs to continue for us to get out of our predicament and the big week is obviously next week, that being the 'Please Buy One Extra Book' week. But (and I keep saying it)thank you all so much. I'll post up the minutes of the committee meeting we had on Sunday over the next day or two. Thanks to Carmel for typing them up so accurately. Today was the day of our first committee meeting (I can't think of another word that has 3 double letters in it like committee. Can you?). Here's the idea of the committee. "We're hoping to get together a group of people to help us decide the future direction of the bookshop. This could be about the kinds of events and initiatives you'd like to see us do, to how you think the shop looks and what can be done to improve our stock. The shop wouldn't survive without its customers and we've always tried to listen to any advice we're given. Having a committee will hopefully help us to focus on the things that matter"
We had no idea how many people would turn up, but suspected that there might be more than 6. There was more than 6. The first person to (literally) press their face against the window was Isabel Losada, who's doing a couple of events at the shop later this year, which will be amazeballs (lol). She was followed by Carmen, Aysha, Jacqui, Kevin, Galit, Jeremy, Vic, Matthew, Simon, Pete, Farah, Suze, Megan Caroline, Caleb, Lizzie,Rachel, Edwina, Rachella, Ben, Chris, Annabel, Kash, Liz, Edel, Alison, Nicky, James, Jo,Elizabeth, Carmel, Shazia, Cara, Omeed, Svein, Rob, Rosie, Ellie, Laura and I bet i've missed a few people out too. Tim and Mark were obviously there too. The place was jammed (I didn't cry) and there were many emails and calls from people who wanted to come, but couldn't make it. Here are some people who were there. With the sheer number of people, it was difficult for everyone to have a chance to talk, and much of the meeting centred on what this committee was actually going to achieve. There were many opinions and suggestions which we asked everyone to write down on sheets of paper. We now have a brilliant overview of what people want at the bookshop and we'll consider all of this over the next day or two. Carmel is doing the minutes as we speak which we'll transcribe somewhere for all to see when we can. I want to say again how incredible it is that so many people were prepared to take the trouble to come to our shop on a cold Sunday morning to show their support. You are all ace. The meeting was followed by a frankly crazy hour of shopping from those who came. Flippin eck. 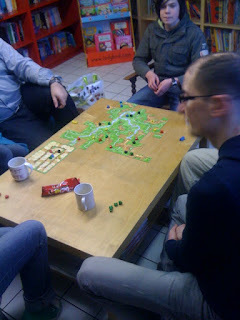 After that was our monthly board games day at the shop (the last Sunday of every month, from 1-5pm. Don't miss it). 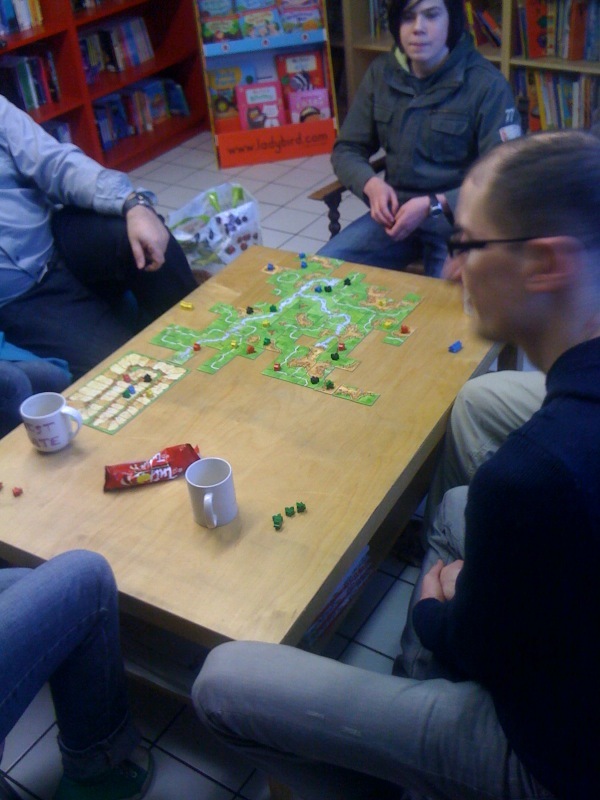 Ker-Plunk, Chess, Scrabble, Connect 4, plus others like Carcassonne, being played here. So, another whopping day at the bookshop, filled with Jammie Dodgers, chocolate chip cookies and many cups of septum melting coffee. I am now going to go through all the suggestions, comments and ideas that the committee came up with and possibly eat some more cheese. YES. Yes it is, that's the time it is. Another step or six towards our target of 'relative safety'. I know I keep saying this, but, please keep reminding people that we're here, please keep pointing them towards the bookshop, please keep supporting us. It's been a great few days and I am slightly euphoric, but there's still a long way to go. You are all spectacular and should this all succeed I will sing songs about each of you and perform an interpretive dance in a large green hat outside the shop. You don't want to miss that do you? Today should be made into a short film , shown on Channel 4 and win various awards at small festivals around Europe. I woke at 6.50am to the sound of Ollie trying to get our attention by sneezing and rhythmically banging the back of his head against his cot. After taking him into the living room and placing the Old Macdonald musical Tractor in front of him, I looked out of the window. If I had tweeted the moment, it would simply have declared 'RAIN!!!' (this will be the only use of exclamation marks in this blogpost, so enjoy them). Rain isn't usually the ideal weather for shopping and I suspected that today might not turn out to be as rewarding as the huge lovely monster of a day that yesterday was. From the moment we opened the doors this morning there has been wave after wave of generosity and goodwill. A tsunami of love if you will. Our first customer was Pamela, a lovely lady who picked up 3 out of print horror novels we'd found for her. She couldn't afford all of them but she paid for two and promised to come back and settle up when she had the money. She always does. The trickle of customers started and pretty soon the shop was bustling with familiar faces and people that we'd never seen before. It was pretty obvious that most of these people had heard about our struggle and wanted to come and help. These were all people who hadn't been here before and now felt that it was important enough to get in touch and help. Our wonderful regular customers were also out in force today and I was moved to tears on more than one occassion by the generosity some people showed. From one young customer looking up at me and telling me ernestly 'I don't buy my books anywhere else', to the jaw droppingly kind offers made by some people that frankly still have my bottom lip quivering just writing this. But Simon, what about the Strugglometer? I hear you cry. Another mammoth day in which we pulled up to 18% of our 'relative safety' target. This is an incredible result after two days. Tomorrow is our first committee meeting at the shop, so if you want to come along, we're meeting at 11.00am. I don't know if we have enough mugs to make coffee for everyone who's said they'll be there, so you might want to bring a thermos flask. This is followed by board games tomorrow afternoon, so a full day awaits. From the moment we let people know about our current situation things have gone haywire. We expected some kind of response, but we didn't realise how quickly things would take off. Today has been our best Friday, er, ever and I don't think our email has ever been so busy. I realise that this is just one day (and we need another 15 of these before we can relax a little), but the goodwill that has been shown has made me shed a tear on more than one occasion today. We've tried to reply to all your messages, but if we haven't yet, then please understand, it's been very busy! We shall try and keep you up to date with how we're getting on. The Bookseller, the Organ of the Book Trade (do they still use that subtitle) phoned us earlier to get the story for their magazine. I think the piece they did is great and it's attracted more and more people to the blog and website. The more comments that a Bookseller piece gets , the longer it tends to stay on the front page, so if anyone would like to offer a few words of support after the article then don't let me stop you. Much like a Church Roof Fund, we have constructed a barometer that will give you some idea of how close to our target (our target being relatively safe). Day one has been awesome and we'll run the barometer all the way through until 'Gum Day'. This is Tuesday March 29th, the day that we are hoping that 350 excited children from lots of schools around Haringey will be meeting Andy Stanton, the author of the hilarious Mr Gum books, at the Bernie Grant Arts Centre in Tottenham. This is 32 days away. This is the result on Day One. An amazing 9% of our target has been reached in one single day. This is A GOOD THING. We have the committee meeting on Sunday, which we're hoping will be well attended. This is where we are hoping to get together a group of our customers who will advise us on what direction the shop should go in future. More info can be found on our website here. Then we have World Book Day next week where we'll be visiting 10 schools over the course of 2 days with 8 authors, which should be a lot of fun, and completely exhausting. Most importantly though of course is that it's my son Ollie's first birthday next Wednesday, so we'll all be off out for a day of fun in a farm in Hertfordshire. I should probably let the farmer know about this. And then the following week will be 'Buy One Extra Book' Week at the bookshop, which is what this whole campaign is leading up to. So we have some exciting times in front of us. Please please keep reminding people that we're here. These next few weeks are so important. It’s just that we can’t really afford to have another nine months like the nine we just had, and despite all your amazing support we are struggling. Author events including Will Self, Mark Billingham, David Vann, Karen Maitland, Christopher Fowler, Laura Dockrill, Magnus Mills and even Maisy Mouse! Well over 300 visits so far to the local schools in Haringey, Enfield and Barnet helping them to promote literacy with author visits, talks, storytelling and whatever else we can. Weekly storytelling and singing for the under 5’s. Supporting local talent by holding book launches, poetry readings and talks by the cream of North London’s literary stars. Even a place to leave your shopping if it gets too heavy and to sit down with a free cup of tea or coffee. The list could go on, but we hope you get the idea. 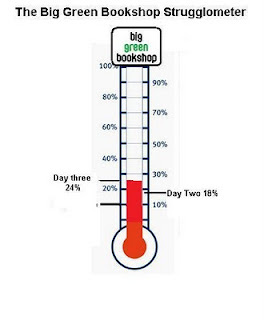 We sincerely hope that you want The Big Green Bookshop to remain here and value what we do and so we are asking for your help. Our bank loan now has nine months to go until it’s paid off. This is our biggest single outgoing each month. Once the loan has been paid off we will be in a relatively stable position. 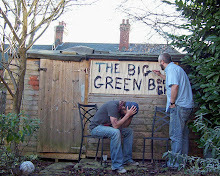 As our last newsletter announced, we’d like to set up The Big Green Bookshop Committee which will support the bookshop, offering suggestions & ideas to improve what we do for our customers in the future. The first meeting is this Sunday February 27th at 11am. Please come along. It’s the 3rd Anniversary of the Bookshop on March 8th. 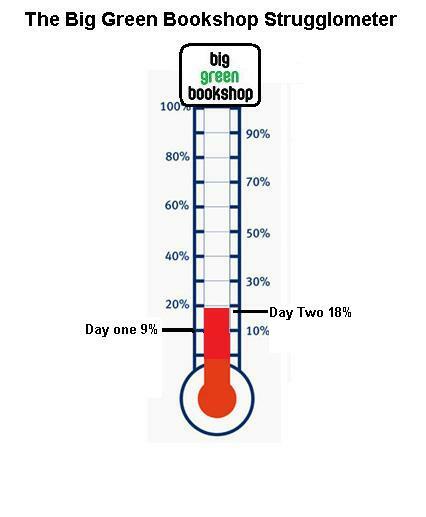 During the week 6th to 12th March we’re asking you all to buy just one extra book from the Big Green Bookshop. We have over 1,000 people on our loyalty card scheme & many of you who are reading this who aren’t. If each of you bought one extra book this would pretty much guarantee our survival. 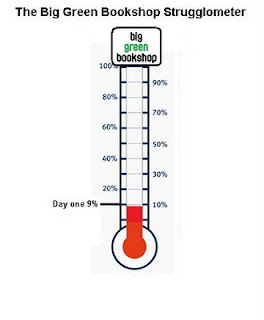 For those of you who cannot make it into the bookshop, but want to help, we take orders over the phone or on our website, and we’ve also set up a ‘donate now’ button at the top of this page if you have all the books you need but would still like to help us out. We have some of the greatest customers in the world and we are constantly humbled by the support you show us.